i don't have stuff shipped to me very often, so the arrival of a box in the mail is the occasion for great excitement: what new development in packaging will be revealed today? when packing an object within a box to be shipped, the goal is to immobilise the object so that agitation and crushing forces don't harm it, while keeping the enclosing box as small as possible. there's been some interesting consumer-facing packing innovation in the last decade, mostly driven by companies that ship a lot of high-value stuff. about 10 years ago, i noticed that dell was shipping assembled laptops in folded, die-cut cardboard matrices. they have recently switched to modular pop-out foam sheets, which do a better job at immobilisation, compression-protection, and volume conservation. dell's boxes have become noticeably smaller. amazon, maybe 8 years ago, started shipping books packed flat and sandwiched inside two layers of corrugated, self-adhering cardboard, like a book raviolo (they have been doing some smart things with packaging research) and have also begun to immobilise objects with large air-filled plastic packs that fill up empty space using a minimum of material that must later be disposed of. i'd never gotten a box in the mail from apple before and was expecting some interesting packing considering how much trouble they go to in designing the product box-opening experience. i wasn't disappointed. these fiberboard corners are mostly empty (i dissected one), have tremendous crush resistance (i applied 168lbs to one of them by standing on it), spread external forces over a large internal surface, and contain one material and one binder (good for recycling). four units completely isolate and immobilise the object (a macbook air) from the surrounding shipping container, and they add less than 2" to each outer dimension. 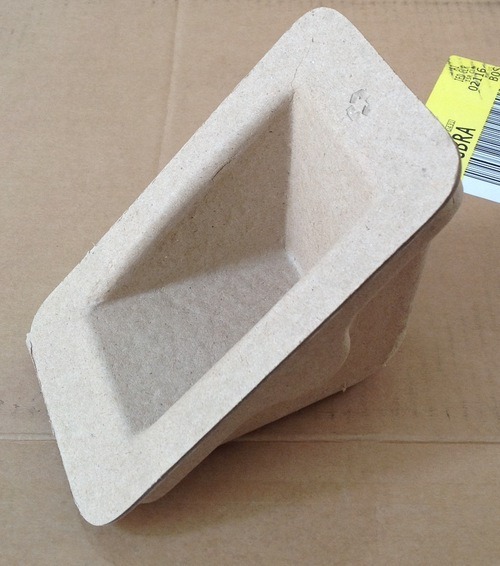 there is no other packaging material other than the box and the corners are recyclable. this parsimonious packing solution is thrillingly elegant.